One of Dalchem’s comprehensive range of products includes epoxy resin encapsulation products. These include the Dalchem Crystal Clear Epoxy Resin Kit comprising of resin and a hardener. The Crystal Clear Epoxy Resin is a highly efficient water clear resin system. It cures at room temperature. 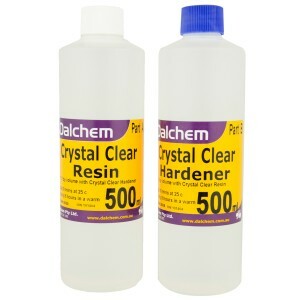 The Crystal Clear Hardener is easy to mix with the resin using equal volume. Dalchem’s Crystal Clear products cure to a water clear glass coat finish and are used for high quality finishes of timber surfaces, flooring, and encapsulating display items. Dalchem’s epoxy resin encapsulation products are available in different packet sizes.